There has always been a cloud over the past, a tenebrous veil, crafting mysteries from our secrets, separating us from the deep well of eternity of our histories. In unraveling these mysteries, we draw a ley line from past to present, and in doing so, we are introduced to one of our protagonists in Oldmoustache Gameworks’ new horror adventure: No70: Eye of Basir. The elder of the two protagonists-brothers, Ehran, speaks his story as we enter, recounting the odd occurrences to which he’s been subject of late. It’s a brief introduction before we cast off, trying to navigate through the haunted house and piece together the fragments of the past to determine just who -- or what -- is behind the strange events that have begun to plague the brothers. These strange events, naturally, continue to plague the brothers as you play, with objects shifting around rooms, doors closing and opening, and phantoms darting in and out of view. 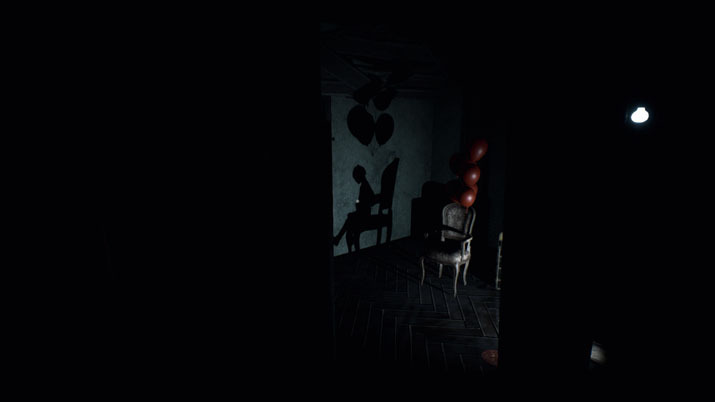 Combine these more traditional shock scares with the dark, sometimes claustrophobic environments, and with the eerie whispering and distant footsteps of the sound design, and you have a solid foundation for a creepy, tense atmosphere. Despite this, however, Basir lacks the more primal tension of titles like Soma, that have hostile entities to avoid, flee, or otherwise deal with. Basir was more haunting than unsettling, the byproduct of a certain je-ne-sais-quoi in Erhan’s narration mixed with the solitude of wandering through a desolate, old house, alone and in search of the truth. My interest was piqued, in any case, but don’t let that sway you just yet; there were a few issues with the narrative thread. Perhaps the largest is that it isn’t quite clear after a point just who it is that you’re playing. Are you still Erhan? Have you shifted to Aras? The question didn’t seem to be addressed in-game, though the Steam store page implies that you become Aras. Beyond that, there is a recurring thread about a young woman who moves to Turkey from Canada after the death of her husband around the turn of the twentieth century. This plot line seems to be important in the first chapter of Basir, but after Chapter 1, it seems to be ignored in favor of pursuing a completely different arc. Perhaps such an abandonment might be overlooked if there was some kind of transition, but the arc really does just seem to fade away without resolution. A part of me does wonder if that isn’t because Oldmoustache Gameworks didn’t want to include too many characters. You never meet any of them (hence the desolation I mentioned earlier [EN: Super Mario 64]), and it might be possible to go through the whole story without learning of them, but every detailed portrait you encounter can be observed, which provides give a bit of backstory on the person. Given the length of the game, there are quite a few characters to learn about from these blurbs, some of whom seem almost completely tangential or unnecessary, yet, for some, still more may be learned via notes placed haphazardly around the levels. The young widow was the subject of a few of these notes in the first chapter, and the developers almost seem to be building her up as the main haunt — even going so far as to give her an appearance as one of the few apparitions — but ultimately she falls by the wayside as the story takes a turn. Speaking of things that fell by the wayside, Eye of Basir seems to have received less than its fair share of optimizations prior to launch. For the most part, the Unreal Engine delivers the graphics with ease, allowing the title to be rich with visual detail indoors and out, but every now and then I would find a corner or hallway where I would get inexplicable frame rate drops. What’s more, there were a few areas in Chapters 2 and 3 where I could see the geometry clipping just a small way from the play area, and some of the plants and grass seem to have been placed hanging in thin air, even in some places easily reached by the player. Such egregious errors aren’t optimization issues in the traditional sense, but they break the tension and the immersion almost as completely. There are, thankfully, no mechanical elements that further compound the problems with immersion, though backtracking aimlessly through the level, looking for a single coin, does do something unseemly to whatever erstwhile tension was present. Still, that’s an issue inherent to the item-collection style adventure genre in general, not just Eye of Basir, so it seems unfair to pin that entirely on the developers, especially when the tension does pick back up fairly quickly, once you start advancing again. If there’s any real critique I can offer mechanically, it’s that there aren’t a whole lot of mechanics. You walk about and collect items here or there to use in other places, and occasionally use the titular Eye of Basir to see hidden objects and messages, but there are no puzzles to it, per se, since you never really need to figure out how to do something, just where to find the trinket necessary for it. You could call that a puzzle in itself, but it really is rather rudimentary. I mention sound there but haven’t touched on it yet, which is an injustice: if there is one thing Eye of Basir does very well, it’s sound. The soundtrack is haunting without being melodramatic, unsettling without being overbearing, and might be one of the few soundtracks I would like to see sold in a DLC listing. Likewise, the in-level effect work contributes immensely to the tension of the title: whispers behind you and footfalls from behind the walls making levels feel claustrophobic and haunted, and gentle wind and the flutter of fabric caught on ruins bringing an empty and abandoned ambiance, as necessary. None of that even touches on the narration, either, which I was very pleasantly surprised to find included at all, since it would have been cheaper and easier not to, given that it wasn’t really necessary for the story or the gameplay. It’s an excellent touch of polish. No70: Eye of Basir is an ambitious title. While the visuals and audio are noteworthy, in the critical areas of story and gameplay, Basir is passable, not exceptional. The brief plot explores, then seems to abandon, what appeared to have been a key plot point, and it’s a bit unclear who your character even is, at times. Both of these issues are highlighted -- or exacerbated -- by a mechanics-light system that shifts the focus onto the narrative. Finally, issues with performance and geometry clipping exist, and these, combined with some sloppy foliage and prop placement, create the occasional immersion breaker: No70: Eye of Basir is a flawed gem with some good facets.